I am often told that people live vicariously through my posts, so in the event that you can't actually have lunch with Senator Lugar feel free to eat vicariously through my posts as well. Of all of the things in life I can pretend to be an expert in, college definitely isn’t one of them. However I do have a decent amount of insight about a very specific topic that all of my friends, who have been in school for the past month, know nothing about, and that is the quarter system. Why are you still here? Are you actually going to college? I struggle to think of a single person who hasn’t asked me (or at least wanted to ask) these questions. The only answer I know to give revolves around the fact that the University of Chicago is one of the few schools out there that’s on the quarter system. With the understanding that I haven’t taken a single class, I already have some thoughts (and advice) regarding this system. Visit grandparents. This is always fun to do, so take that as general advice. Start a book, preferably an interesting one. Start watching new shows. This is one of my greatest successes of this past month, in which I have started Arrested Development and The League (which is the second funniest show I’ve ever seen, beaten only by Archer). Go for a run. Ideally go for more than just one in the month itself, but you have to start somewhere. I can personally say that if you’re going to practice with your school’s cross country team you either have to be really in shape or have a sympathetic running buddy. Hope that some of your friends are going to college near you so you can spend time with them. Go back and visit school. It was only a few months ago that you went here. Pack. The more you delay this the sadder you will be (although it might prep you for the pressure of a college workload if you do it all on the day of your departure). I have three additional recommendations for things to do to escape boredom (consider the above list to be requirements). The first is to be active politically (even if it’s an offyear, there’s almost always an election down the road at this time of year, and even if there isn’t, it’s never too early to start getting ready for the next one). 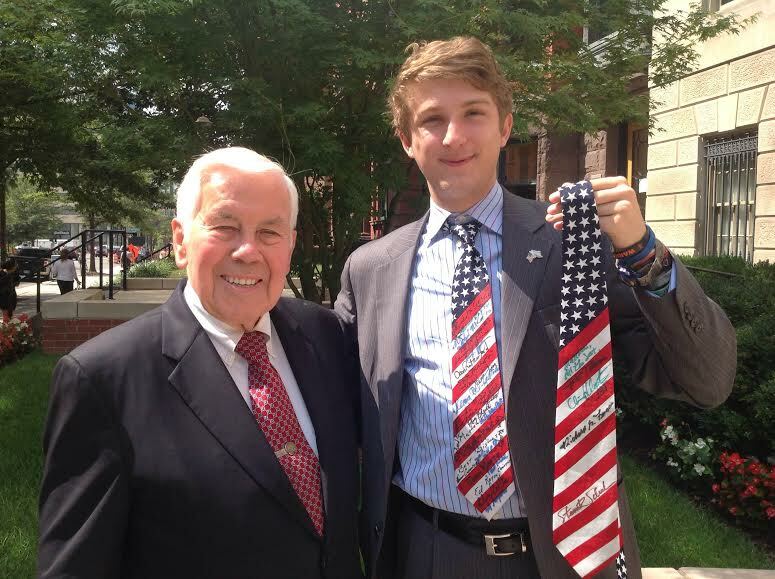 The second is to have lunch with Senator Lugar, who is one of the greatest statesmen America has had in recent years. My final piece of advice for those stuck in the morass of this month is to, of course, start a blog. As Bowling for Soup memorably said, “high school never ends,” so don’t worry if you feel like you’ve been down this road before, because you probably have. I am often told that people live vicariously through my posts, so in the event that you can’t actually have lunch with Senator Lugar feel free to eat vicariously through my posts as well. Previous Previous post: Who am I? Why am I here? Question: you JUST started Arrested Development????? How have you LIVED? One of my favorite shows. I guess I just assumed you watched it or I would have recommended it to you by now. Have fun at college!